The year was AD 1144, and it had been nearly fifty years since the first crusaders took back the Holy City of Jerusalem. Almost unthinkably, the leaders of Christendom were now facing another great loss: Edessa. Edessa, a city of great importance to the Christian empire which sat in modern-day Iraq, had been conquered by the Turks. Christians and their leaders had been slaughtered. Edessa had been the first organized “crusade state” in the East after the conquest of Jerusalem in AD 1099. It had been the vision of Godfrey of Bouillon and other Christian leaders for a new kingdom to be established in the Holy Lands. Other crusade states would follow Edessa and each was intended to give feudal organization to all of the lands being reclaimed by Christendom. The fall of Edessa, however, would change everything again. The papacy and other church leadership found themselves at another crossroad. Would they answer swiftly and decisively with a second crusade? Or would they begin the long, slow, and painful process of giving back the lands they had won? 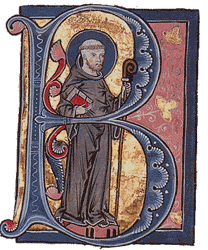 Bernard committed most of his younger life to monasticism according to the Cistercian order. For health reasons, however, he was forced to leave the monastery just before his fortieth year. He then fully entered a career as a public figure who was an adamant supporter of the Papacy. Bernard was an adviser to five different popes, each of which were recognized by the branch of the Catholic Church which still held majority influence among the Franks in the wake of the Holy Roman Empire. These popes, beginning with Innocent II (papacy AD 1130-1143) were considered the “reformed papacy,” and their authority was recognized throughout Western Europe with the exception of southern Italy and Rome itself. The content of Bernard’s sermons and speeches were somewhat surprising for one who was often called “honey-tongued”. He earned this nickname because of his continual emphasis on the love of Christ. When charged with calling Christians to take up arms against their enemies – Muslims in particular – Bernard was often light on the sweetness. Pagans must not be slain if they may by other means be prevented from oppressing the faithful. However, it is better they should be put to death than that the rod of the wicked should rest on the lot of the righteous. The righteous fear no sin in killing the enemy of Christ. Christ’s soldier can securely kill and more safely die. When he dies, it profits him; when he slays, it profits Christ. The Christian exults in the death of the pagan because Christ is glorified thereby. But when he himself is killed, he has reached his goal. Bernard of Clairvaux held the first crusade assembly during Easter week of AD 1146 in the French city of Vézelay. It was a large gathering with many important dignitaries in attendance. At the end of Bernard’s address, the people began to crowd the altar in order to receive crosses for their garments. There was apparently so much enthusiasm that the crosses ran out and Bernard began to tear off pieces of his own garments to give away (Schaff). 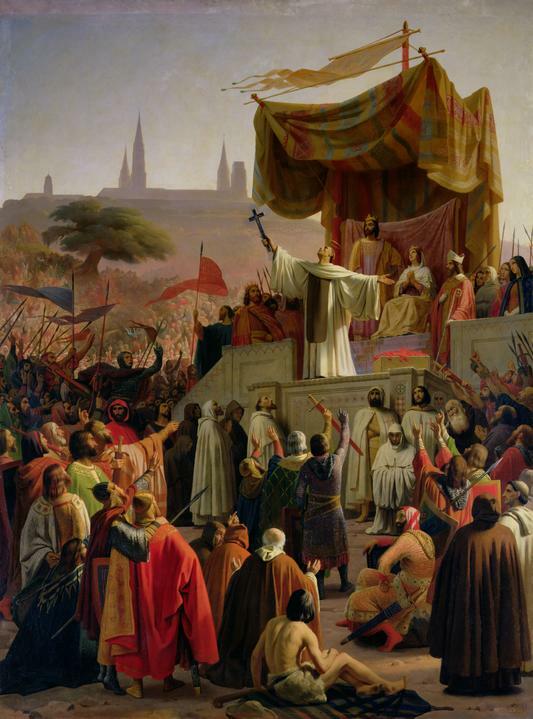 There were several differences between the new crusade and the First Crusade. First, with the exception of Bernard, the Second Crusade was largely initiated by political rather than religious leaders. For the most part, the Second Crusade never had the equivalent of a landmark Deus Vult type of speech from the papacy. Bernard, who was in his mid fifties by this point, traveled throughout Europe and enlisted the support of King Louis VII of France (reigned AD 1137-1180), his wife Eleanor of Aquitane, Emperor Conrad III of Germany (reigned AD 1138-1152), and Count Thierry of Alsace of Flanders (Dutch; reigned AD 1128-1168). Second, the condition of Muslim forces had changed drastically. The First Crusade had been successful in part because the forces of Islam had been heavily divided. This was not the case in the mid twelfth century. On the contrary, Islam had formed several strong Muslim states, the most notable being that which would belong to Saladin and the Kurds within the next few decades. Their forces were more unified, organized, and this time they were prepared (Latourette). In 1147, some 200,000 allied Christian forces set out to reclaim Edessa and other lands to the East for the new kingdom of Jerusalem. As with many of the early crusade attempts, the Jews who were encountered along the way were treated as enemies and targeted with violence. Bernard insisted that the Jews should not be treated as the Muslims, but rather should be won over only if by intellectual means. From the outset, the Second Crusade was a disaster. Many Western forces never made it very far into Asia Minor before being put down. Those who survived the initial onslaughts found themselves at odds with Eastern Christians. The small group that finally reached Damascus in Palestine, which was still some 300 miles away from Edessa, were bitterly defeated. Not only was Edessa not reclaimed, many lives and much land was lost in the process. The Second Crusade was considered such a monumental failure, that most medieval biographers of Bernard tried their best minimize his influence on the crusade in their accounts. Perhaps an even more damaging result was the furthering of a nearly irreparable schism between Eastern and Western Christians – a rift which still affects the relationships of believers around the world today. In AD 1119 in Jerusalem, two men named Hugo de Payens and Godfrey St. Omer, along with six others, made a promise to God near where the temple had once stood. They swore an oath to protect believers who sought to make pilgrimage from the coast to Holy City. This small band became the charter members of the military order known as the Knights Templar – or “the knights of the temple”. Over the next few decades, the Templars became a force throughout Europe. By the turn of the thirteenth century, they reportedly had thousands of Templar houses from Mediterranean to the Atlantic, with 27 houses of knights formed in England alone. They not only grew in numbers but also in wealth. Putting aside all Hollywood and literary legends regarding the Templar “treasures,” all historians agree that their revenue was immense. It was, in fact, their wealth and prestige that became their undoing. 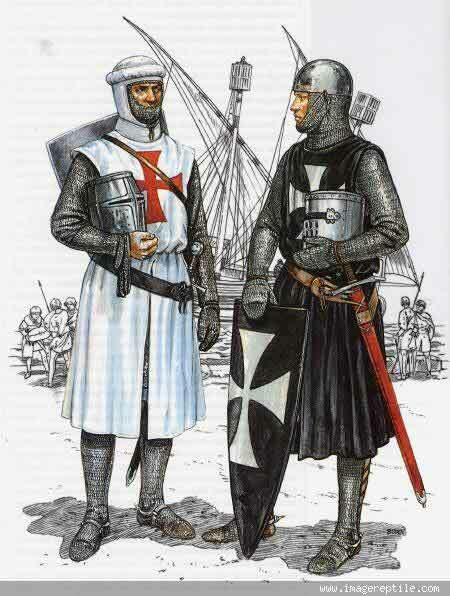 By the fourteenth century, the Templars had largely become known as rogues. Their apparent rebellion from papal authority and the threat of their power and assets led Pope Clement V to disband the order and redistribute their wealth at the Council of Vienne in AD 1312. The original purpose of the knights was to protect and care for the sick, which was directly associated with their name. As mentioned in previous posts, many crusaders and pilgrims that followed had been stricken with severe illness or injury. The Hospitallers were officially recognized as a military order by Pope Pascal II in 1113. While the earliest leader of the knights appeared to be one Gerard from the southern parts of France, the order became famous under Raymond de Puy de Provence (AD 1083-1160), who was grand master of the knights for some 40 years. Like the Templars, the Knights Hospitallers amassed significant wealth, power, and prestige. As the order multiplied throughout Europe, they too swore protective oaths on behalf of believers around the world. The latter, however, were able to retain a much more favorable relationship with the papacy. In fact, after the Templars were disbanded, much of their wealth was given directly to the Hospitallers. Bernard was born in AD 1090 near the French city of of Cîteaux, a location that would be of great significance to him later in life. He was born into a family of Burgundian nobility and experienced at least some degree of privilege. From most accounts, Bernard’s father was a participant in taking Jerusalem during the First Crusade. From the earliest moments of his life Bernard was deeply sensitive to spiritual things. Around the age of 22, Bernard began his religious career as a monk according the Cistercian order. The Cistercians, who hailed from the aforementioned city of Cîteaux (also called Cistercium), were also called the “White Monks” because of the traditional garments they wore. The Cistercians were a return to the old school, so to speak; seeking to preserve the Benedictine order and voluntary poverty. Almost in protest of other monastic forms, the Cistercians moved their monastic communities outside of inhabited areas. In order to maintain their unique structure of private prayer and polity, seclusion was necessary. 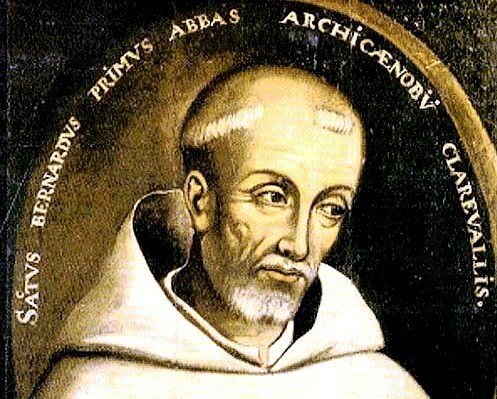 In his mid to late twenties, Bernard was a committed member of the Cisterician abbey at Clairvaux, which was itself responsible for planting several monasteries throughout Europe and even in the Holy Lands. Over the course of his life, Bernard contributed to the founding of nearly 350 monasteries. According to Asbridge, the Cistercians grew from two houses in AD 1113 to three hundred fifty-three houses by 1151, which set them well above their counterparts at Cluny. Bernard is remembered for his superlative-style writing regarding the love of Christ and his eloquent sermons. For these reasons, Bernard was often called “the honey-tongued doctor.” Bernard was committed to elevating the humanity of Jesus and the adoration of the Virgin Mary. His most famous work was perhaps On Loving God, a short but powerful text in which Bernard sought to move believers from the love of self to a deep love of God that sees the value in human existence from God’s perspective. According to Bernard, the more fully one learns to love God would, to some measure, dictate the degree to which one enjoys the greatest rewards promised in heaven. -For more about Bernard of Clairvaux, see http://www.christianitytoday.com/ch/131christians/moversandshakers/bernardclairvaux.html. Schaff, Philip. History of the Christian Church, vol. 5. Please Subscribe and tell others!